Rosie O'Donnell just announced that she is all done with the turdfest that is The View. She is quitting three weeks early after her verbal scuffle with co-host Elizabeth what's her face. That show was a major yawnfest before she was on it and will certainly return to that. Even though she gets a little carried away now and then, I must say that I do quite like that Rosie. 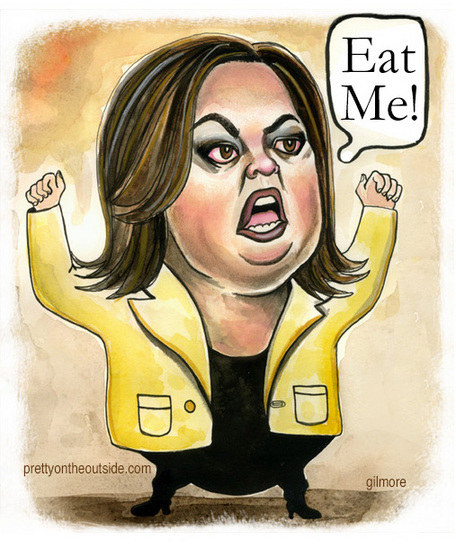 At some recent award benefit, Rosie went on a rant that ended with her grabbing her crotch and telling Donald Trump to Eat Me! God bless her. Now I have to figure out how to un-Tivo that show. Watercolor, colored pencil, and ink on paper. I'm really going to miss Rosie on the view! celebrity garbage. We are having our liberties taken from us and nobody is doing anything! I'm scared to draw Rosie, but you've done it quite perfectly my friend. I love the convex crotch too. Rosie is awesome! I miss her on the view.